I don’t know where September went. I blinked and it was gone! Although we have had a few warm days the temperature has dropped, the leaves are changing and autumn is officially here! But that’s ok, all the fun fall decorations are here, all my scarves are making a comeback, and pumpkin everything has taken over! 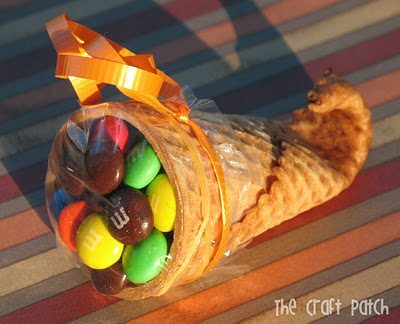 I came across this adorbs M&M cornucopia the other day on Make Life Delicious. What a cute idea for a sweet fall treat! And this cornucopia is MUCH better than the one in the Hunger Games haha!